The Longhorn Cowfish, not a fussy eater. I read the article on Thiaminase and I found it very informative. I was left with a question, what am I supposed to feed my porcupine puffer? I see that there are some non-Thiaminase fish offerings, but puffers do not eat fish. It caused fatty liver disease over time. It seems that everything I feed him is high in Thiaminase. Squid, scallops, clam, mussel, oyster, shrimp is always in the mix. I do add Boyd's Vita Chem to the food. Is this enough to counteract the effects of the Thiaminase. I used to use Selcon, but the Boyd's seems to be a more complete multi vitamin. This is a quote from an article by Kylyssa Shay. Do you think that this is not true in all cases? Maybe puffers cannot have fish as their main diet, but can have it as part of a diet? "Balloonfish are not piscivores. That means that, in nature, they don't eat fish. Do not feed fish, live or dead, to them. Feeding fish to pork puffers may cause something called fatty liver disease, a usually fatal ailment. accustom him to eating fish, making him a danger to future tank mates. Carefully read the ingredients of any prepared fish foods you give your pet. Choose those with invertebrates such as shrimp, krill, squid, clams, or mussels listed as their first ingredient. Avoid all prepared fish foods with any type of grain or fish meal listed first in the ingredients." 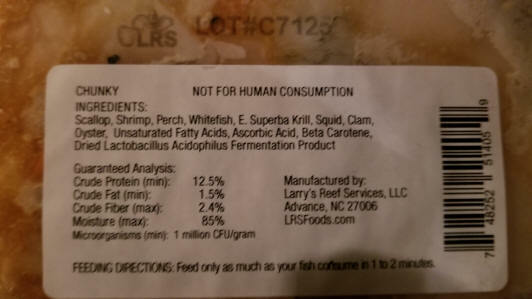 This is a snap of the ingredients of the main food I feed all my fish. There is some whitefish and Pollock in it which is on the no-thiaminase list. Maybe this food is better than I thought?? Well Mr. Bob, So sorry I forgot a question on my last post. I am from the deep south. I live in Mo now. But it is crawfish season and I am having some shipped up from La for a crawfish boil. I read on here freshwater foods ain't good for puffers but the articles I read all pertained to live fresh food. Does that include crawfish? I was going to give them a good ro soak and freeze. It would not be a main food source. I know... Diverse foods, lol. If you are around Mo after lent come on over for a cold beer and a good old fashioned crawfish boil! <Ah, much appreciated. Have tried to have these in Cal., but not the same. I am getting a Dogface Puffer this week and wanted to ask a few questions. My first question is about feeding. Galveston beach is kind of dirty as we have days when people aren't allowed to swim do <due> to bacteria in the water. 1. Would feeding my Puffer clams from Galveston be toxic? <Leave the clams where they are. You may introduce bacteria or an unwanted disease into your system. Read here and related articles/FAQ's as to feeding puffers. 2. Would gathering the clams and putting them in a new tank with clean water and allowing them to filter feed for a while (a month or more) help lower any toxicity in the clam? Also I was thinking about getting sand from the beach to renew my existing sand and wondered if Galveston sand would be toxic to my fish. 3. Will adding sand to an already set up tank cause the tank to recycle? If so regular water changes would be in order but I wanted to ask so I would be prepared. Puffer food requirements. Hi Mr. Fenner I purchased a 12 inch nose to tip of the tail fin yellow A Meleagris puffer. <A beauty of a xanthistic variety, Golden as it were/is, but would be better if it had started as a smaller specimen in captivity> He lives in a 100g tank and I feed him mussels( the common food type from British Colombia) on the shell. We tried little clams and shrimps but he only nibbles on them. My question is how many mussels does a puffer this size need a day. I usually feed him 1 to 2 mussels a day. Water stays clean. <This should be fine... your specimen may well want, and consume much more, but it's better to limit its intake... and to continue to try varying its diet> I also have a 7 inch lunare wrasse who cleans up the small leftovers. Do you think the addition of a 6-7"goatfish would be appropriate. I would like a goatfish since they eat leftovers in the substrate. <Appropriate, yes. Do keep your eye on filtration, water quality. Bob Fenner> Thanks, Everett.